Travel anywhere in Romania with XTravel. The Romanian Black Sea Coast is a blend of old and new. Many historical sites, ancient monuments, traditional villages together with the traditional culture of the region, which is a mixture of Romanian, Greek, Macedonian and Turkish influences, coexist with all the modern facilities offered by the resorts. The town of Sinaia (height/altitude: 2,500 ft.), home to the Peles and Pelisor castles, is nestled at the foot of the Bucegi Mountains, in the Prahova Valley. 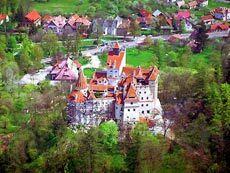 This fortified medieval castle, often referred to as Dracula's Castle, was built in 1377 to protect nearby Brasov from invaders. It also served as a customs station. The Danube Delta is the second largest delta (Volga is the first) but best preserved of European deltas, with an area of 3446 km2. The Danube Delta is home to more than 300 migratory and permanent bird species; 160 kinds of fish that include caviar-bearing sturgeon and 800 plant families. 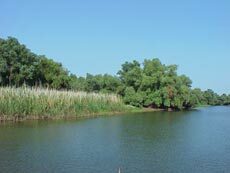 This wetlands preserve covers more than 1,678,000 acres (2,622 sq. miles) comprising channels and canals widening into tree-fringed lakes, reed islands, numerous lakes and marshes, oak forests intertwined with lianas and creepers, desert dunes and traditional fishermen villages. The Danube Delta is listed as a UNESCO Reservation of the Biosphere because of its peculiar features and its variety of ecosystems . Brasov, Sibiu and Sighisoara are some of Europe's best-preserved medieval towns. They are living, veritable symbols of Transylvania. Visitors can stumble upon unique architectural treasures, small ancient tiny houses that line narrow streets, cobblestoned passageways and covered stone steps as they wander. 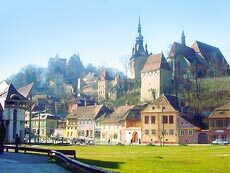 Sighisoara, which Vlad Tepes called home, is one of the most beautiful towns in the heart of Transylvania. German architectural influences are visible throughout the entire city. The classic European spa is a thermal - mineral water springs resort, where people take a cure under medical supervision. 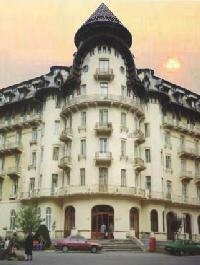 Romania has one third of European thermal and mineral springs. The healing effect of these springs is proved and make these spas so popular. First discovered by ancient Romans, Hercules Spa (Baile Herculane) and Calimanesti-Caciulata Spa, from where Napoleon III use to take mineral water are famous spas. Romania is very rich in mineral resources, as the thermal, the sulfurous or salted water, the natural mud. The salt-mines, the ozone rich mountain air are other healing natural factors. There are 48 monasteries in total, some with fortified walls. These unique monasteries and Byzantine churches with their exceptional exterior frescoes are one of the most fascinating sights in Romania. Seven of the painted monasteries have been included on the Unesco World Heritage List. 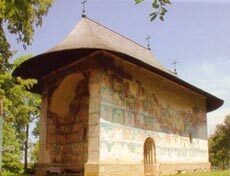 The five main painted monasteries near Suceava are Humor, Voronet, Moldovita, Sucevita and Arbore. Also nearby are Dragomirna and Putna monasteries, the latter home to an active community of monks and a small museum containing medieval manuscripts and rare textiles. Bucovina is worth visiting, not only for its wealth of religious art and the beautiful monasteries, but also for the natural beauty and simplicity of the region. It is a territory with clean unspoiled nature. It has a unique landscape. Just 12km away from Brasov city, in a glade surrounded by coniferous forests, at the foot of the Postavaru Massif, you will find Romania's most famous skiing resort, Poiana Brasov. Poiana Brasov offers you a large variety of sports during all seasons. The resort is well known for its ski slopes with various difficulty degrees, from beginners to advanced skiers.